1. There are five colors (red, blue, yellow, green, black) of the D3 device. 2. You can select in the beginning any of the Dig-destined D-3 starters Digimon besides Wormmon. 3. You can digivolve in battle either be Naturally (which needs to be obtained after beating a boss) or use the Digi-egg to digivolve (each digimon comes with one but you can find others and digimon can only use certain digi-eggs). 4. 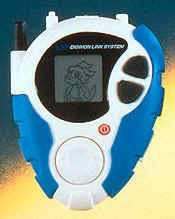 Battle require shakes like the Digivices but only to get you DP. This is the D-Terminal:The D-Terminal allows Digimon fans to connect with friends, play games, or engage in battle. Attach the D-Terminal to a friend's Digivice or D-3 and go into battle between the digital monsters. 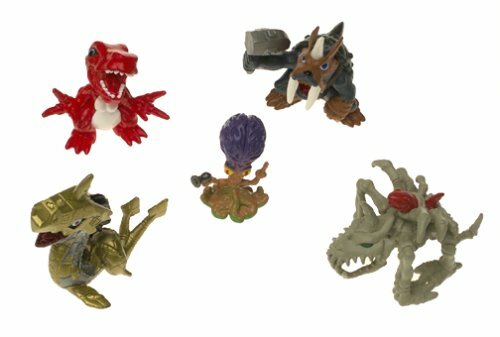 Want to know the names, stats, fighting techniques, physical characteristics, and more on over 350 Digimon? The D-Terminal can tell you! Two single-player games and a function that translates English words into Digi-words are also available on the device.